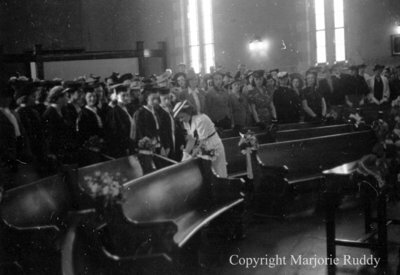 A black and white negative of the Baccalaureate service at Ontario Ladies' College in Whitby, Ontario on 4 June 1939. In this view the people attending the service are standing in the pews. The Baccalaureate service was part of the Commencement Exercises for the graduating class of Ontario Ladies' College. All of the students of the school attended the evening service at the United Church. The senior class wore caps and gowns and listened to the keynote speaker, Reverend Peter Bryce, D.D. Ontario Ladies' College Baccalaureate, May 1939, Marjorie Ruddy. Whitby Archives A2013_040_927C.